Also known as Epidermoid cysts, are small sacs filled with fluid or solid material just beneath the skin composed of a protein called keratin. They can arise along with severe acne conditions, swollen hair follicles and skin trauma and are usually found on the face, neck, and trunk. There are twice as many men that develop cysts than women. They are considered to be asymptomatic, meaning they do not carry with them any other symptoms, however, they can become inflamed or infected if left unchecked too long. Some may also have a foul-smelling discharge due to the bacterial back up beneath the skin. If you’re wondering how to get rid of cysts in New York, contact Dr. Rokhsar right away! Typically painless, cysts can become inflamed or infected which result in pain and immediate attention by a dermatologist. When cysts are surgically removed, the patient’s pain and discomfort are relieved with local anesthesia and a small injection to numb the area. An incision is made over the cyst, and almost all contents, including the cyst’s wall, is removed and depending on the size, small stitches may be required. The cyst’s internal wall produces keratin, so it is important for the entire cyst, along with the wall is removed in the procedure. If cysts are removed at home by draining it of its contents, the skin wall will refill the area with keratin, returning the cyst. This temporary removal can cause further irritation, infection and possible scarring. Dr. Rokhsar can easily remove cysts in office. Patients have reported some soreness after the area is treated, though most consider cyst removal to be a completely painless experience. 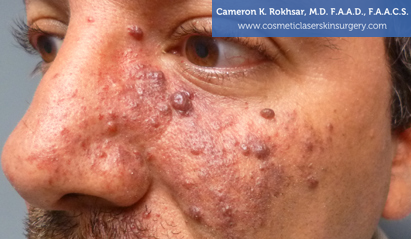 As an experienced cosmetic and dermatologic surgeon, Dr. Cameron Rokhsar strives for minute scarring. Dr. Rokhsar can further resurface scars with a variety of lasers for the best cosmetic results after surgery.